Essential oils have been used as far back as the 12th century and today have found a renewed popularity. There are many ways to use essential oils including treatment of physical problems, to relieve stress and anxiety or give your home a fragrant and inviting ambience. But it is important to understand that essential oils can vary greatly in quality. To enjoy their powerful benefits it is important to choose from the top rated essential oil brands. The best will rate highly for purity, quality and of course, value for money. Sifting through the many essential oil brand reviews can be time consuming and confusing. To help, I’ve put together a list of the best oils based on these criteria. All of the brands on this list are top quality and will deliver the aromatic and therapeutic results you are looking for. This list was updated February, 2018. Plant Guru are praised online for their purity and potency. Their essential oils make the list due to their lasting strength of fragrance and therapeutic grade quality. Strict quality control is assured with every batch of essential oil at Plant Guru. From sourcing through to testing by third party laboratories, the oils are 100% pure, undiluted and free from any additives, chemicals or pesticides. Plant Guru are available in single aromas, blends, or sample packs so you can try a little of everything which is a great idea. 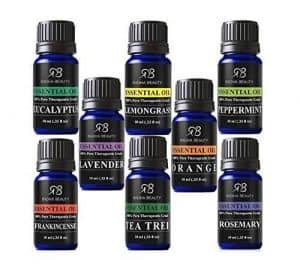 One of their most popular packs contains 14 popular essential oils and is a great starting point for beginners. Other packs are grouped according to their use which makes it convenient to get a range of oils for a specific need. Examples of these are the Kitchen pack,Â Weight Loss packÂ and Respiratory kit. Their range of synergy blends is impressive as well. Most include names that make it easy to recognize the application for the blend, including Sleep Tight, Breathe, Love Potion and Headache Relief. If you’d like to try a few of the blends, this pack is terrific value. 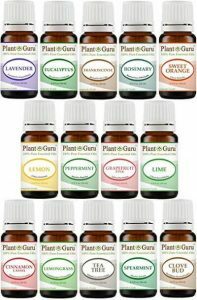 For their range, price and popularity, Plant Guru are an obvious inclusion in the list of best brand of essential oils. Read our full Plant Guru Essential Oils Review. Healing Solutions is one of the best brands of essential oils for healing with a motto of ‘high quality at an affordable price’. They’ve put together some great, aromatic blends to suit every mood and use along with a comprehensive range of single essential oils. The blends offered by Healing Solutions have been crafted to provide maximum effectiveness, while offering great value for money. They have an blend for most ailments – ease headaches and jaw tension, breathe easily and deeply, soothe aching and tired muscles, heal and protect when you’re under the weather, relaxation and calming, and one designed to ease you into a peaceful, rested sleep. And if you want a variety of blends, try one of their best selling packs like this one. Each of Healing Solutions single oils and blends delivers high quality, pure essential oils that come with a Purity Guarantee. Independent quality testing is carried out to maintain transparency for customers. Another of the top essential oil brands around is Plant Therapy. Quality assurance is a high priority for Plant Therapy with several testing stages to ensure the quality of the oils. They are first tested organoleptically before being sent to third party laboratories for GC/MS testing. This rigourous process ensures all Plant Therapy products are 100% pure and of the highest quality. Offering a comprehensive range of single oils and synergy blends, Plant Therapy stand out with their ‘Kid Safe’ products – the first essential oil range developed for children by Robert Tisserand. These oils and blends can be safely used on or around children are clearly marked for easy selection. A range of Kid Safe kits are available that help to fight specific conditions for children, such as this Wellness Sampler kit with Germ Destroyer, Immune Boom and Sniffle Stopper. There are also roll on blends pre-diluted for topical use including Tummy All Better, Better Than Kisses,Â Shield Me and No More Warts. Adults certainly aren’t forgotten with plenty of synergy blends available in bottles or roll on blends. Some of the more popular include Germ Fighter, Relax, Tension (Headache) ReliefÂ and Rapid Relief. 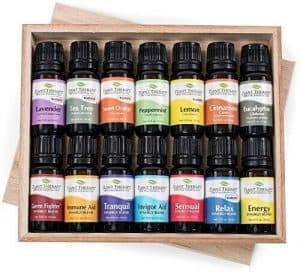 Plant Therapy offers some great value starter kits including a popular set of 14 oils (7 synergies and 7 singles). Most of their packs also come in an attractive wooden box that is great for storage and gift giving. Lastly, Plant Therapy include many less common oils in their range which is why they are one of the top rated essential oil brands. If you are looking for something different, their range won’t disappoint. There is a lot to like about the Fabulous Frannie range of essential oils (apart from the name). They supply a range of 100% pure essential oils in a range of singles and blends. To guarantee quality, all oils are tested by GC/MS prior to dispatch from vendors and supplied with a Certificate of Analysis. Covering all the basics, Fabulous Frannie is a great range to use for all your aromatherapy needs. In the diffuser, bath, beauty products and more. 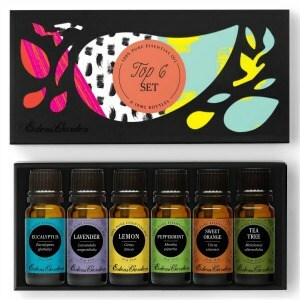 Their basic sampler sets of 6 single oils, 6 synergy blends or 5 roll on blends are the perfect starting point for beginners. Synergy blends are available for improving mind, mood and body and include choices like Moody Girl, Protect and Calm Anger. Fabulous Frannie is a good essential oil brand to add to your collection and won’t disappoint. To finish off my list of the best essential oil brands is the Edens Garden aromatherapy range. With a strict emphasis on the freshness and quality of their product, Edens Garden promises to deliver the highest quality oil available. Edens Garden oils are entirely pure and unadulterated while rigorously tested to ensure they meet the highest industry standards. Their high quality is evident in the potency they deliver – one or two drops in your diffuser is enough to fragrance a large room for hours. The purity of the Edens Garden oils means they’ll do exactly what you want them to. Keep it simple for your basic applications with a big range of single oils (try their top 6), or choose a blend (e.g. Purify, Fighting Five, Stress Relief) with confidence that each drop will do the job. The Radha range of essential oils is another top essential oil brand. These luxurious essential oils are 100% pure and carefully extracted from plant material to maintain the highest level of purity. Rahda Beauty’s pack of eight essential oils is hugely popular, covers the basics and is a great starter kit. If you’re new to aromatherapy and want to try and see what oils work for you, this is great value for money. Rahda Beauty’s range of oils is not as extensive as other brands, which is why it isn’t included further up the list. But they offer great packs of essential oils, along with larger sizes of some of the most popular oils such as lavender, lemon and tea tree oils. Essential oils are a great way to purify and cleanse the air in your home and to use as a natural, chemical-free treatment for a all sorts of physical and emotional conditions. To ensure you’re maximizing your aromatherapy, only use the highest quality essential oils. Look for 100% purity, no additives and no dilution, just like each of the essential oil brands listed above. A higher price doesn’t mean higher quality, and if you are new to essential oils, try one of the small sample kits. Once you find a brand you like (it doesn’t only have to be one), then buy more. My picks of the best essential oil brands are all high quality products. Try them, you won’t be disappointed. Great list! It’s so nice and refreshing to see an essential oils post that doesn’t mention a certain 2 MLM brands. Some of these I haven’t seen before. Im excited to check them out! Thanks Ashley 🙂 Yes, there are lots of great alternatives available that are just as good…if not better. What do you think about the Jade Bloom brand? I have recently found this brand and it appears to be good. I would love any feedback! Hi Mika, I had never heard of the Jade Bloom brand until this, so sorry I can’t give any feedback. Their product range does look great and it appears that they endeavor to produce top quality products. If you do try them, please let me know what you think. I personally use Jade Bloom and love them! High quality oils that are affordable. They do gc/ms testing for every single batch of oils they produce and have the results availible fir you to view on each oils page. For any you cannot find, although I personally haven’t run into that issue yet, you can email them and request it. Also, they have a company owned face book group where they post specials and coupon codes pretty regularly. They look like a good option too Sue. I particularly like the sound of some of their blends. Can anyone give me feedback on piping rock oils? Sorry, I don’t know anything about this brand Amy. If you do try them, please come back and let us know what you think. I use Piping Rock and Edens Garden. Have been very happy with every purchase. I’m so glad to see Eden’s Garden on your list. The quality of their oils is outstanding, their selection wide ranging, and their customer service absolutely excellent. I enjoy their oils immensely. I have been using Piping Rock oils and have had no problem with them. Doterra is certainly another alternative. I have just recently started using doTERRA and have been impressed with every product I have tried! That is not easy to say. I’m just so happy to see a list like this. So many people think Young Living is the only option…but I love Plant Guru. I love Plant Therapy and Now! I an willing to try these brands, as well. Was always curious about Edens Garden. Thank you so much for This! I started with Plant Guru, and am now using Healing Solutions and Edens Garden with great success. I believe it’s a misconception that you have to spend big bucks to get a great product. It is so good to see a list that does not include MLM’s. I really like Plant Therapy, like others have mentioned, but I like Rocky Mountain Oils even better!! Have tried Doterra and was not impressed. The scent is not strong and I had to use far too much. Having opened all brand that specialises in lavender recently, and comparing it to Doterra, there was a huge difference in concentration. So glad I can now refer to a list of genuine oils where I do not feel like I am getting ripped off. Such a great list! I’m wondering if you’ve found any info on whether or not it’s safe to ingest Plant Guru oils. Kristy, what is your opinion of Young Living Essential Oils……. quality? I know the prices are higher, but is it worth it? I also am interested in the answer to this question. A neighbor introduced me to Young Living, but i am new to essential oils and am still early in the learning stage. I have no first hand experience with Young Living Oils, so can’t advocate for or against their quality. However, they do appear to have a production process that ensures a high quality product. But in this they aren’t alone. There are (I believe), many other alternatives that won’t cost as much. On the flip side, be wary of oils at a bargain price. Hope that helps, Kristy. 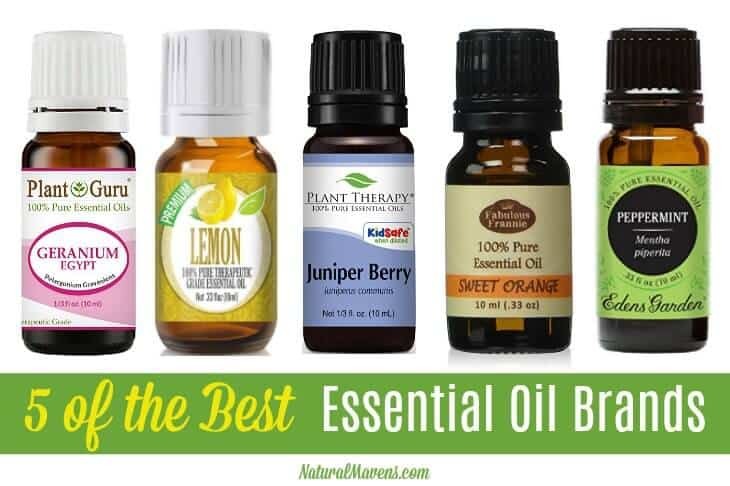 I have been using NOW essential oils for a few years now and love them. Kristy Sandler have you had any experience with them? No, but heard good things. RMO is a great company that has some wonderful blends! I’m pretty sure Jade Bloom and Rocky Mountain have been 3rd party tested and found to be adulterated. I can understand why you stray from the “major 2” brands….but there’s a reason why I only use a certain one of those. No adulterated oils in our third party test results. I will pay a bit more to ensure the quality of what I put on my kids. I have always heard good thins about Plant Therapy. I may have read too fast but I was looking for oils that could be taken internally. Also, (I don’t know or will probably slap myself what MLM stands for) what about Melaleuca? They seem to be just moving over from the west, I’d never heard of them until 6 months ago or most of your list until now. Thank you, very informative and objective. Here is some information about taking oils internally that will help https://www.naturalmavens.com/ingest-essential-oils/. I don’t know anything about Melaleuca, will check them out. And MLM stands for “Multi Level Marketing” – it is the business model used by some essential oil brands (Doterra, Young Living).